Porcelain-berry (Ampelopsis brevipedunculata) is a deciduous, woody, perennial vine native to Northeast Asia. The leaves are alternate, simple 2 ½ to 5" long and wide with a heart-shaped base and 3 to 5 palmate lobes. The inconspicuous flowers are green-white and appear in June through August. The colorful grape-like fruits mature from September to October changing from pale lilac, to green to a bright blue. Porcelain-berry grows and spreads quickly in partial to full sunlight. This vigorous invader grows well in moist soils and can often be found along ponds, stream banks and forest edges. Porcelain-berry can out compete native trees and shrubs by reducing the availability of light, water, nutrients and space. This tendril-climbing vine colonizes by prolific growth and seeds that are spread by water, birds, and other animals. 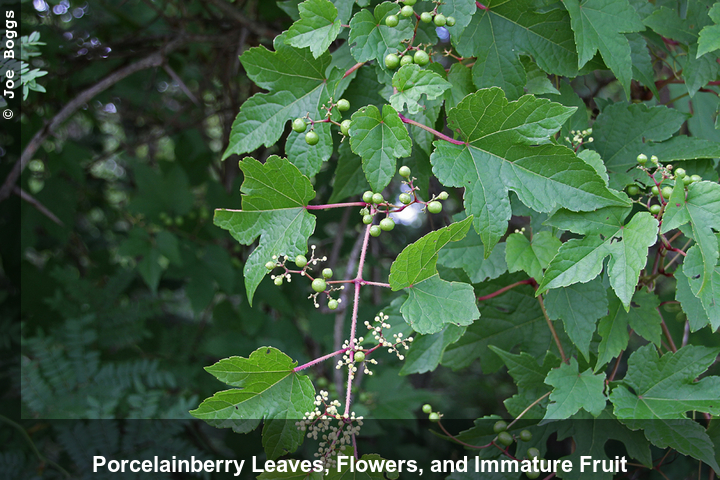 Porcelain-berry can be confused with species of grape (Vitis) and heartleaf peppervine (Ampelopsis cordata) which is native to the Southeast and has unlobed leaves and smooth (hairless) stems. Once porcelain-berry is established it can be difficult to control due to the vigorous root system. Vines in the home landscape can be pulled up by hand and the rootstock should be removed. Systemic herbicides like glyphosate and triclopyr can be applied to cut stems or leaves to kill entire plants including the roots.